Disclaimer: This is still a work in progress! What is a complete guide to Japanese? Despite what many are led to believe, learning Japanese is not significantly more difficult than learning any other language. The truth is mastering any foreign language is quite an endeavor. If you think about it, you are essentially taking everything you’ve learned in life and re-learning it in a completely different way. Obviously, no single book can really claim to teach you everything about a language including all the vocabulary a fluent adult commonly obtains during her life. So what do I mean by a complete guide to Japanese? Most Japanese textbooks only go over a small subset of what you need to learn Japanese, typically covering a certain amount of grammar and vocabulary with a smattering of dialogues and readings. However, mastering a language requires much more than just learning grammar and vocabulary. What most Japanese textbooks fail to recognize is that they can’t possibly hope to cover all the necessary vocabulary and kanji (Chinese characters) to obtain full fluency. This guide fully recognizes that it cannot teach you everything word by word and character by character. Instead, it will give you a solid understanding of the fundamentals with a wide collection of dialogues and examples. In addition, it will go over various techniques and tools to enable you to teach yourself. 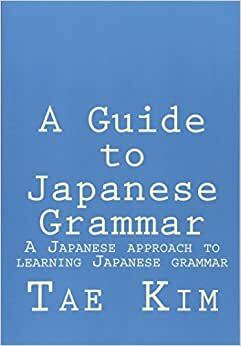 Essentially, this book is a guide on how you can learn Japanese to complete fluency by actually using Japanese in the areas of reading, writing, listening, and speaking. Another important distinction in the complete guide is that it does not try to hide or avoid more casual but perfectly acceptable aspects of the language. Many textbooks often avoid styles of speech and vocabulary you would normally use regularly with close friends, family, and acquaintances! In this guide, you will be introduced to all aspects of the language based on real-world practicality and usefulness; not on an artificial, filtered version of what others consider to be “proper” Japanese. There are a large number of useful tools on the web for learning Japanese. Not only are there excellent online dictionaries, which are often better than many print dictionaries, there are also great tools and social networking sites for online collaboration and language study. In order to fully utilize these online resources or if you’re reading this book online, you’ll need to setup your computer to support Japanese. I’m currently writing this as quickly as possible without a lot of proofreading so there WILL be many typos and mistakes for the first few revisions. The Complete Guide is currently NOT licensed under a creative commons or any other license. I might consider some kind of license when I finish the first draft.